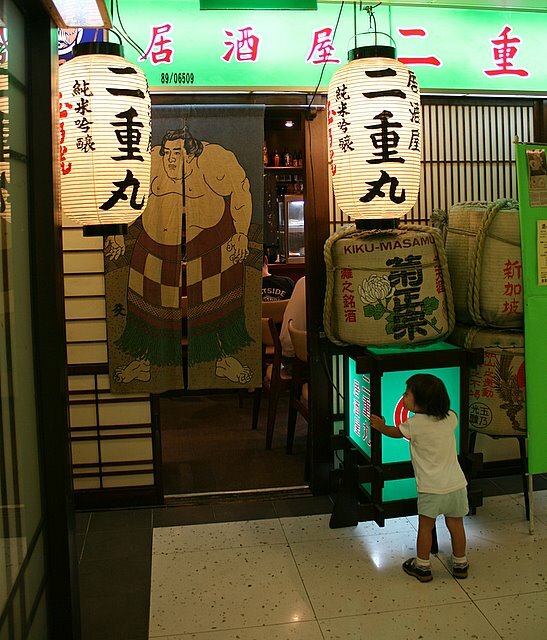 Izakaya Nijumaru is where many Japanese in Singapore used to flock to for fairly authentic food in a casual setting. Helmed by a Japanese chef and his Singaporean wife, Nijumaru's literally an institution at Cuppage Plaza, having been there for about 10 years. But it seems to have become a little bit more localised these days. For one thing, there are now English menus available. 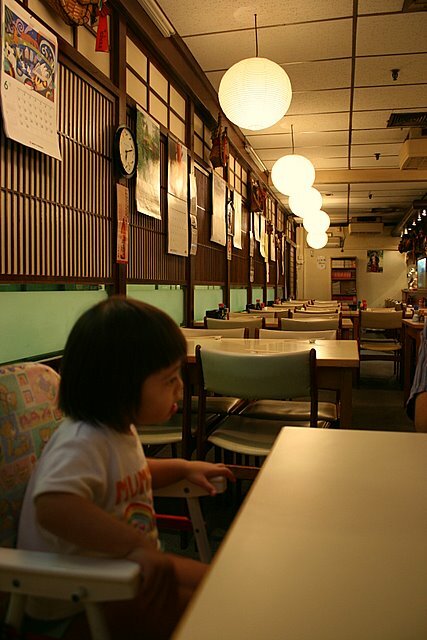 In the early days, there was no menu at all, only names of dishes in Japanese on handwritten slips lining the wall. The clientele used to be almost entirely Japanese. Previously discreet waitresses now banter loudly in Mandarin, Hokkien and Cantonese, making you wonder if you aren't in Crystal Jade instead (oh, this should give you a clue about the service - more Chinese-style brusque efficiency than polite Japanese hospitality). But decorwise, it hasn't changed - still the same layout, furniture, rice-paper windows and lantern globes. I hoped the food was still as good. 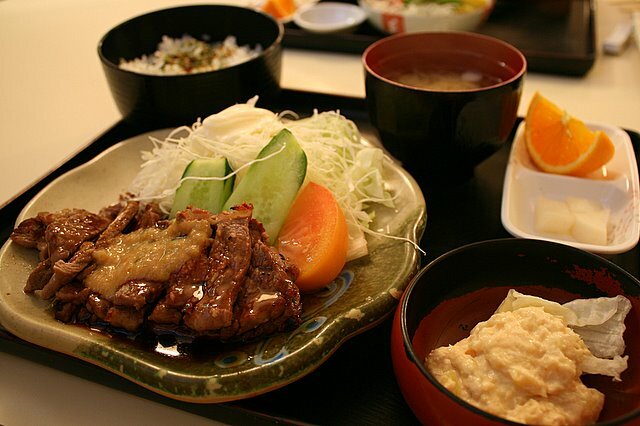 Traditional izakayas are drinking places that offer small dishes to be shared. Here, if you prefer to eat individually or aren't sure what to order, set meals are an easy choice. The menu of a la carte items is extensive but the fare here is generally simple. You are given a cold, moist oshibori (wet towel) while you wait for your food but there is no otoshi (obligatory chargeable snack, like the Chinese restaurant appetiser pickles). 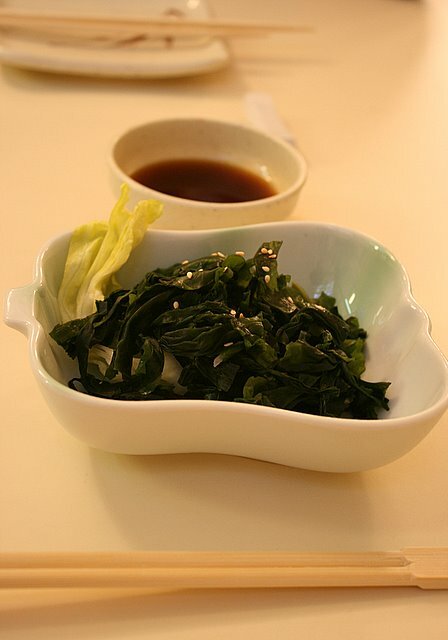 We started with a seaweed salad (S$6) - wakame with tangy ume (plum) infused soy dressing on the side. Certainly gets the saliva glands going! 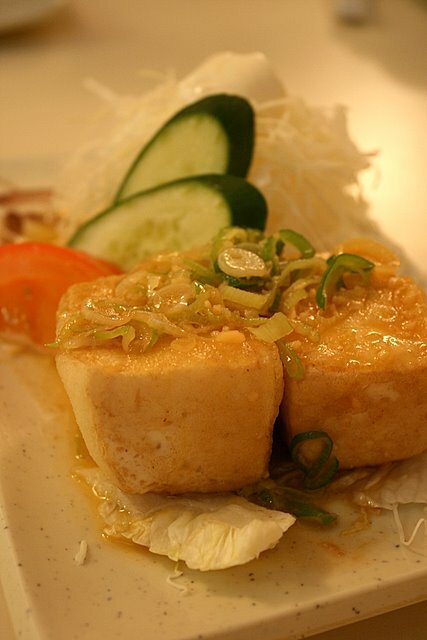 I've seen others rave about the tofu steak (S$5) so we gave it a try. It's really just tofu blocks lightly floured and fried in butter. The result is a crinkly salty skin with meltingly soft insides. It's not bad but a bit too "fusion" for me. The oily richness of butter is too heavy for healthy tofu. I think agedashi still works better. Well, Nadine liked it anyway. Looks like she will eat tofu any which way it's done. I opted for the Unajyu set (S$20). 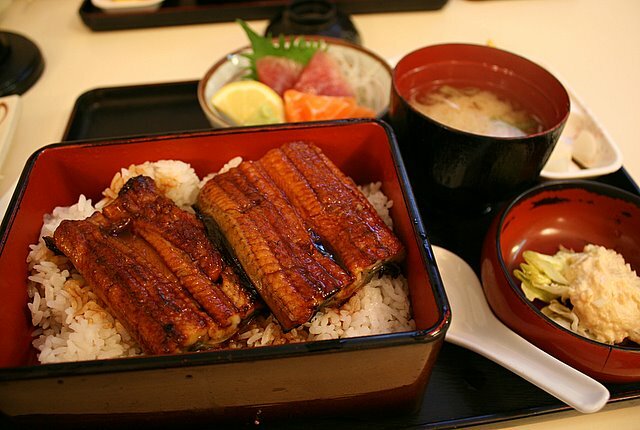 Two luscious, thick slabs of unagi atop warm, fluffy rice. You can choose sashimi or tempura for your side dish - I took sashimi and it was sweet, fresh and thickly sliced. A salmon mash salad, shiro miso soup, slice of orange and white pickled daikon complete the set. I enjoyed this very much, so did Nadine - she likes her grilled eel, good girl! Hubby took the beef teriyaki set (S$15.50). Oddly it's three thin fillets of beef stacked atop each other and cut into bitesize slices. Topped with a garlicky dressing. Reasonably tasty but the meat was a little overdone - too chewy. Due to good business, Nijumaru has expanded its premises to almost one quarter of the whole floor. I'd come back in a heartbeat to try the other dishes. I remember I had nasu dengaku (miso-grilled eggplant) and gindara (grilled cod) that were quite good many years ago. However, hubby isn't all that impressed with the place and thinks it's not much different from Waraku! Oh well, you can't please them all! See more photos from other blogs here, here and here. I love the photos of the restaurant... so authentic! I don't think we have anything similar in KL... The Japanese restaurants here tend to me more modern and chic.